Easily baste and season foods with this convenient Oil Dispenser Bottle featuring a durable and reusable glass bottle with a screw-on plastic top with an attached silicone basting brush and plastic cap. Simply tilt the bottle to start the flow of liquid into the flexible brush. 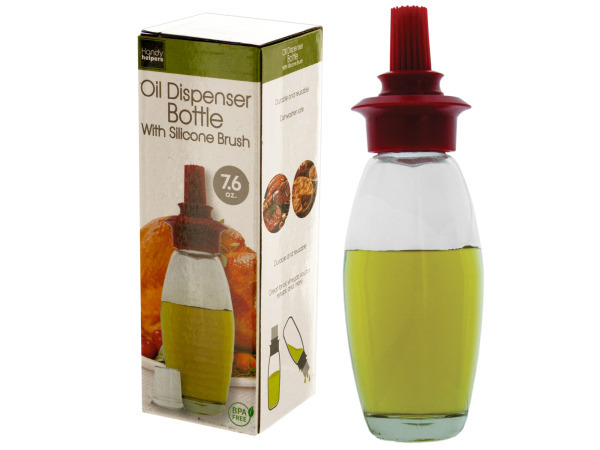 Great for marinades, oils, vinegar, sauces, syrups and more. Bottle holds 7.6 oz. BPA free. Dishwasher safe. Measures approximately 7.25" tall with a 2.5" diameter at its widest point. Comes packaged in an individual box. 6 pcs. 12 pcs. 18 pcs. 24 pcs. 30 pcs.